Severe thunderstorms hit most of the area Tuesday afternoon and evening. RALEIGH (WTVD) -- Severe thunderstorms hit most of the area Tuesday afternoon and evening. There were numerous reports of trees down across central North Carolina along with heavy rain and strong, damaging winds. At one point, there were more than 500 lightning strikes in Durham County alone. There were no injuries reported, however. Wednesday will be warm and humid with temperatures reaching the lower 90s. Just a few isolated thunderstorms are possible in the afternoon, with most of the activity confined to the Triad and the coastal plain. The weather will turn more active late in the week as a system moves out of the Tennessee Valley toward the Carolinas. 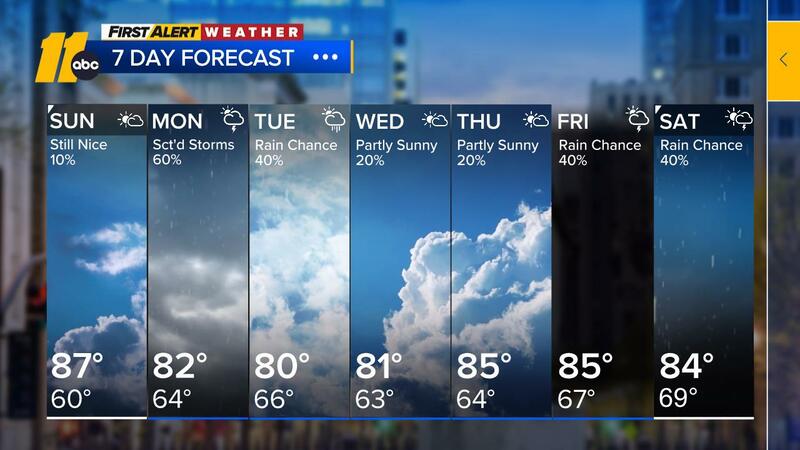 This system will spread shower and thunderstorm activity into Raleigh Thursday and Friday afternoons.